Granulation, grinding, chopping and shredding are all common ways to describe the specific task of size-reduction of scrap that results from plastic processing. Every plastics processing facility not only produces a certain level of imperfect product that is rejected as scrap, but also generates scrap from starting up and dialing-in their production process. Reclaiming scrap material can make the difference between profit and loss. But to be valuable – whether it is recycled back into the process or sold to others for recycling – scrap must be reduced to a manageable, uniform, and usable size. And doing this is the role of plastics granulators and shredding equipment. 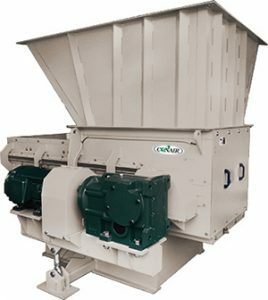 So, what are the basic differences between granulators and shredders and where do they overlap? “Beside-the-press” models are usually used to grind relatively small volumes of sprues, runners, and off-spec parts, as well as edge trim from film lines, for immediate recycling back into the process. Generally, granulators operate with high rotor speeds (standard granulators operate at 400-500 rpm) with relatively low torque. (Even so-called “low-speed” granulators have rotors that turn at upwards of 190 rpm.) Granulators operate primarily by cutting/slicing materials, with rotors that take repeated, small bites of material. For cutting power, they depend on high-horsepower motors and heavy flywheels. Even then, granulators can be subject to jamming and possible rotor damage if large parts are dropped in too quickly. Single-shaft shredders cut scrap downward against one or more stationary bed knives. They typically use a larger motor which, along with the stationary bed-knife design, allows for heavier-duty operation, yet makes maintenance and service easier. 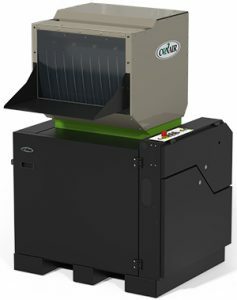 Single-shaft shredders are considered very productive on rigid plastic, film, and fiber materials and, as a result, are quite popular in the plastics industry. Dual-shaft shredders models employ two, counter-rotating shafts that cut against each other to shred scrap. They are thought to be more efficient in shredding bulky scrap but are more complex, more prone to shaft damage and require more knife maintenance, since two sets of knives are used—one on each shaft. Plastics granulators and shredders are important pieces of auxiliary equipment for plastics processing factories. When choosing a granulator or shredder, it is important to examine the characteristics of each piece of equipment as well as the needs of your factory. Visit next week for part 2 in this series.